The results are in for the 2015 TripAdvisor Travellers’ Choice Awards, and once again Scotland has graced the winners’ lists! Four Scottish islands have made it into the UK and the Channel Islands top 10, while six of our beautiful beaches rank in the top 25, many for the second year in a row. Edinburgh was also voted second-best UK destination, and Glasgow came in at number 10 – see the full listings here. Based on user rankings, the Travellers’ Choice Awards are an excellent indicator of truly wonderful destinations – but with so many award-winning places to choose from, it can be hard to decide which one to visit next! Find out more about city breaks in Glasgow and Edinburgh, or read on for a closer look at this year’s best beaches and islands and discover what awaits you in each. Ranked 4th best in the UK and the Channel Islands, the Isle of Arran combines rolling hills with idyllic beaches, and rich history with vibrant Scottish culture. Its varied landscape means the island is perfect for all sorts of activities, and you’ll also find loads of great attractions to visit: take a stroll around the gardens of Brodick Castle (pictured) or enjoy a dram at the Isle of Arran Distillery. Famous for its dramatic landscapes, the Isle of Skye is a breathtaking land of enchanting waterfalls, peaceful bays and jagged mountain peaks. It’s also a paradise for wildlife – you might spot red deer, puffins, otters, pine martens or golden eagles – and is home to several castles and museums, giving a taste of the island’s eventful history. Orkney‘s largest island, Mainland, is a real treat for history enthusiasts: the Neolithic village of Skara Brae, the Norse-built St Magnus Cathedral, and the atmospheric standing stones of the Ring of Brodgar are just a few of the fascinating sites located here. You’ll also find excellent local produce, a thriving arts scene and a wealth of stunning beaches, such as Warebeth (pictured). Located in the north of the Outer Hebrides, Lewis and Harris make up Scotland’s largest island. Both areas blend enigmatic history, rich Gaelic culture and truly inspiring scenery, with Lewis home to sites such as the Gearannan Blackhouse Village (pictured) and the Calanais Standing Stones, and Harris boasting some of Scotland’s finest beaches – such as Luskentyre, featured below. Jumping up 6 places from last year, Luskentyre on Harris has been named 8th best beach in the UK. With miles of soft sands, shimmering blue-green water and sweeping views of Taransay, it’s no wonder the beach is so popular – if you’re lucky, you might even find you have it all to yourself. Overlooking the Moray Firth, Nairn‘s gorgeous beach is a long, open stretch of golden sands backed by dunes and a promenade. It makes a great day out from Inverness, which is a half-hour drive away, and is just a few minutes’ walk from a great play park, two golf courses and several lovely cafés. With its rocky coastline, turquoise waters and sweeping golden sands, Durness Beach is exemplary of the spectacular scenery of the north west Highlands. Look out for birdlife from the beach and be sure to visit the nearby Smoo Cave, an atmospheric cavern that encloses a 20 m waterfall. Despite making it into the top 20, the relatively little-known Calgary Bay on the Isle of Mull is one of Scotland’s best-kept secrets. Backed by a wide stretch of machair, a grassy plain dotted with wild flowers, it’s the ideal spot for wild camping – just imagine waking up to this view! 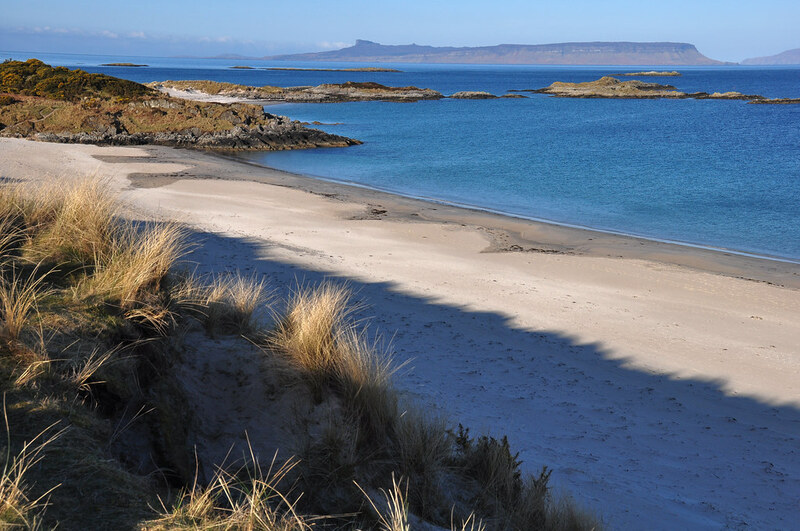 The boundless white sands of Camusdarach by Arisaig have inspired countless travellers – the beach was even used as a setting for Local Hero, Bill Forsyth’s 1983 film. Relax by its crystal waters and soak up incredible views of the rugged peaks of Rum and the Cuillin on Skye. A hotspot for surfers, Kiloran Bay is a peaceful curve of golden sands backed by the rugged terrain of the Isle of Colonsay. As well as being an ideal location for walking and watersports, it offers wonderful views across to Jura and plenty of caves and rock pools to explore. Of course, these are just a handful of the beautiful beaches and islands awaiting you in Scotland. Find out more about the different regions of Scotland, or get inspiration for your next trip in our holidays section. Are you visiting any of these award-winning places this summer? If so, don’t forget to share your photos on Facebook, Twitter or Instagram using #brilliantmoments!